On arrival at the airport, you will be received by our representative and your guide. You will then be checked into Hotel in Paro. The drive to hotel will be about 10 to 20 minutes. The watchtower or the Ta-Dzong was built in 17th Century to guard the Paro Rimpung Dzong (fortress) below. It was the third Kind who restored the Ta-dzong and converted into national museum. 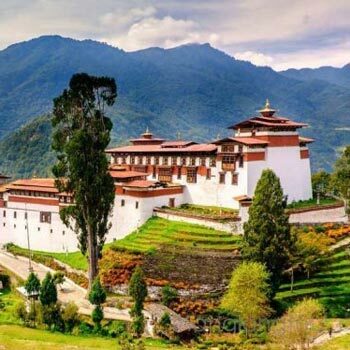 The visit to museum will familiarize about the Bhutanese way of life and will also help you to learn the natural and culture history of Bhutan. 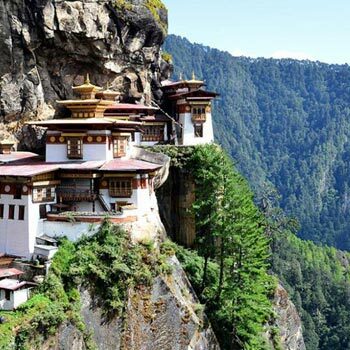 Regal and imposing Dzongs are arguably one of the most distinct and important structure of Bhutan and are architectural masterpiece and are fascinating as their function and beauty. 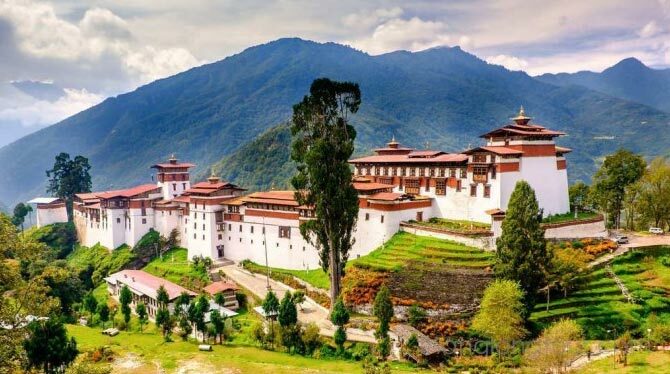 For Bhutanese, the striking architectural marvels hark back to the earlier times, to the source of law and order, peace, harmony, legitimate authority, centre of learning, strength, defence, festivity and social life. The original Paro Dzong dates back to 17th century, built by Shabdrung Ngawang Namgyel, the man who unified Bhutan, but then it was burnt down in 1907 and was re-built in the same year with the same architectural design. Currently it is the head quarter of the district headed by the head administrator and monastic body with about 200 monks. Hike down to the bridge and drive to the town, stroll around the town. Dinner and overnight at Hotel Paro. After breakfast drive to Thimphu, the capital city of Bhutan. En-route, visit to Ta-chhogagang temple and hike down to 14th century suspension bridge made out of iron chains. The great engineer and Buddhist poet call Lama Thangtong Gyelpo or Lama Chamzampa (bridge maker) built it. Halt a night at Thimphu. Thimphu with the population of about 90000 is the biggest and most populated city in Bhutan. Most of the inhabitants consist of civil servants, business people, private employees and students. However, it is Thimphu is probably one of the smallest capitals in the world. In the afternoon walk along Thimphu street and visit to Craft Bazar where the handi craft from village are directly sole here. After a Break, visit to Painting School, It is the centre of learning for Bhutanese artists, depending upon one interest, one can specialize in one of the thirteen arts and crafts. The thirteen arts includes painting, weaving, sculptures, black smith, embroidery etc. This is the best place to learn about Bhutanese arts and crafts. Visit to Takin Zoo, we can see famous national animal of Bhutan call taken. These animals have very strange shape and very strong smell. Local believes that it was created by famous lama Drukpa Kuenlley or popularly known as divine madman. It was said that, he joined the head of a goat and a body of a cow together. Visit to handmade paper factory, where Bhutanese make paper manually. Although the process of making paper what you cxan see is simple but the amount of time taken to collect the raw materials like bark of Daphne plat, collecting roots of some plants to make into a glue consumes lots of time. Apart from small heater to dry papers, everything is manually done. It is one of finest papers in the world and highly recommended for artist. Explore Thimphu Town, after lunch we will explore Thimphu Town. Thimphu has one long street and two half street. The Town is small and people are quite friendly. If you are interested in buying authentic handicraft best place is to visit Craft Bazar. Later drove back to Paro in the evening. Night halt at Paro. If you are interested to take a glimpse of Himalayas, it is advisable to drive early in the morning. En route stop at Dochula pass (3150m), enjoy the panorama of the Bhutan Himalayas. Here you can spend sometimes walking around and photographing the 108 Druk Wangyel Chortens. Built in 2004 to celebrate the stability and progress that His Majesty has brought to the Nation, this hills of 108 religious monuments in the middle of the pass reflects Bhutan’s spiritual and artistic traditions. As you descend from pass, you will observe dramatic change in vegetation. At the lower elevations in Punakha and Wangdue, cacti, banana plants, poinsettias and other semi-tropical plants dominates the exotic landscape. Continues your drives towards and visit to Punakha Dzong. Built in 1637 between the confluence of Po chu (male river) and mo chu (female river), this forties monastery is winter residence of Bhutanese spiritual leader, the Je khenpo or Head Abbot, and the central monk body comprising of over 350 monks. The Dzong is stunning examples of Bhutanese architectural , sitting at the fork of two rivers, porting the image of medieval city from the distance. The Dzong was destroyed by fire and floods over the years but has been carefully restored and is today a fine example of Bhutanese craftsmanship. On the way back to Hotel at Lobesa, will be having a short hike to Chhi-med ( means no dogs) lhakhang in the picturesque vally, to the temples of Bhutan’s most famous saint, the lama Drukpa Kuenley, populary know as divine made man. Drukpa Kuenley built a small chorten there. It is a pilgrim site for the barren women. Drive down the valley to the town of Wangdiphodrang. Here again there is a very large fortress built in the shape of a sleeping bull. Our road gradually winds its way up towards the Pele La Pass at 11,152ft, where we make stop for views of the snow clad peaks, including that of Bhutan’s sacred peak Mt. Chomolhari. Possibly, your picnic lunch is planned at Chedebji Chorten (Stupa) patterned after Swayambhunath in Kathmandu. It is a popular picnic lunch and pilgrimage for Bhutanese driving east-west road. In afternoon, we arrive in the town of Trongsa after 6 hours of driving. Trongsa is a very popular place with largest Dzong in Bhutanand certainly one of the most impressive ones. It was from here that the present royal family emerged as the most powerful force at the beginning of this century. You may love to wander around Trongsa Township.In the morning you will visit the inner courtyard of historical Trongsa Dzong followed by a watchtower above the main Dzong. Watch tower (Ta Dzong) has a fine temple at the top containing original Mongol Armour and a large prayer wheel outside. After lunch, you drive across the Yotong La 11,234'and descend eventually into the valley of Chumey, the first of four Bumthang valleys. Here we will visit the Palace used primary by the second King as his summer residence, and hike for about 15 minutes that brings us to the Prakar monastery, followed by visit to Yathra Weaving centers (a Colourful wool weaving) . Then we’ll drive onto the Jakar the center of Bumthang valleys. Bumthang valley is one of the most sacred in the kingdom and innumerable legends surround the area. It is here that the kings were cremated and the present royal families trace their ancestry back to a famous saint called Pemalingpa, who was also a smith in Jakar Township. After breakfast start the walk from the hotel to Jambay Lhakang (Lhakhang means temple) and continue to Kurjey Lhakang. After Kurjey, you will cross the suspension bridge over to Tamshing Lhakang. Continue walking to the Swiss farm and then on to the main town area. The vehicle will meet you at this point and drive you to visit other sights in and around Jakar; which may include homeopathic hospital, the cheese factory, the castle of the 'White Bird', perhaps one or two local temples and a walk around to visit woodcraft workshop, dying workshop, and the five water wheels behind Wangdicholing Old Palace. Overnight at Guest House, Jakar. From the township of Jakar, you first climb out of the Bumthang valleys on the twisting mountain road towards the Yotong La (11,000ft/3,353m). Near the pass is an area of wild cane/bamboos that is a well-known habitat for Red Panda. The road then descends to Tongsa but instead of stopping here for the night you will drive on, past Chendebji Stupa, over the Pele La (11,000ft/3,353m) and start the descent until you reach your hotel located on the bank of the river. Total drive of about 7 hours. Overnight at hotel, Punakha. You will drive past Wandgue town and Dzong along the east west high way. On reaching at a junction called Lobeysa, you will take a diversion and drive towards the valley of Punakha to visit a ‘temple of fertility’ or ‘Chimi Lhakhang’. Chimi Lhakhang was built by lama Drukpa Kunley in 1499. He subdued the demoness of the Dochu la with his ‘magic thunderbolt of wisdom.’ A wooden effigy of the Lama’s thunderbolt is preserved in the Lhakhang, and childless women go to the temple to receive a wang (blessing) from the saint. It’s a 20-minute walk across the rice fields from the road at Sopsokha to the temple. The trail leads across rice fields to the tiny settlement of Pana. There are very few monks at the temple, which is surrounded by a row of prayer wheels and some very beautiful slate carvings. Walk back to meet your transport and continue drive towards Thimphu along Dochu La pass where we make a short stop once again to view the Eastern Himalayas. Descend from the pass brings you the village of Hongtsho, a Tibetan settlement and then onto Thimphu. After lunch in Thimphu, drive in the evening to Paro. Total drive of about 5 hours. Overnight at hotel. Morning hike up to the Taktsang Monastery (Taktsang means Tiger’s Nest), which is 900m high above the floor of Paro valley. According to the legend, it is said that Guru Rinpoche flew to the site of the monastery on the back of a flying tigress in 8th century, and mediated for three months. A leisure walk of 4-5 hours on footpath that gradually winds it way up. 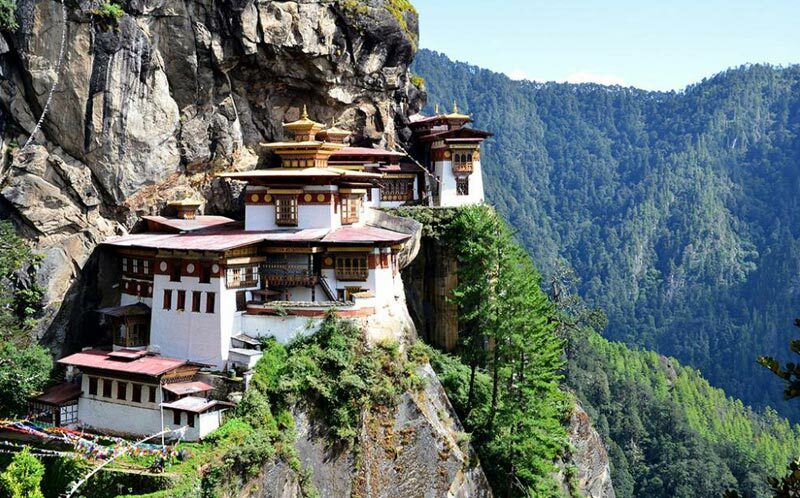 We stop at Taktsang cafeteria and have a glimpse of spectacular viewpoint of the jagged cliff looking as if it was clutching and protecting the very monastery built into crevices. Lunch at View point and overnight at Paro. After breakfast take the departure transfer to Paro Airport for your onward journey.